For the Thai Vinaigrette, mix lime juice, honey, fish sauce, ginger and chili sauce in small bowl until well blended. Stir in green onions. Set aside. Next, heat oil in large skillet or wok on medium-high heat. Add shrimp; stir fry 2 minutes or just until shrimp turn pink. Remove shrimp to plate to cool. Toss salad greens, papaya and bell pepper in large bowl. Divide salad mixture evenly among 4 plates. Top with cooled shrimp. Drizzle with Thai Vinaigrette. Sprinkle with cilantro and peanuts. 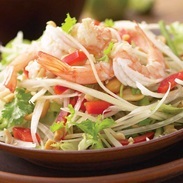 This entry was posted in Food and tagged healthy, papaya, prawn, salad, shrimp, spicy, Thai by Miss P. Bookmark the permalink.